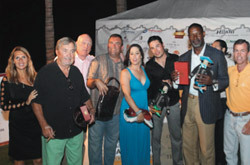 Dream Homes of Cabo hosted the Cabo Celebrity Invitational with Mexican golf legend Lorena Ochoa and 15 other sports and entertainment celebrities included among guests such as actor of the television series “24” Dennis Haysbert, former Minnesota governor Jesse Ventura, World Long Drive Record Holder Mike Dobbyn and retired NFL linebacker Bill Romanowski. The events were held April 26 through 28 of 2012 at the world-class Marina and Golf Resort, Puerto Los Cabos in San Jose del Cabo, Mexico. Paul and Andrea Geisler, owners of Dream Homes of Cabo, designed the weekend of events to help introduce Los Cabos restaurants, hotels, activity and concierge services to over 300 of their event guests. They made it easy for everyone to get to each event and non-golf activity with Destination Management Company, Transcabo’s complimentary VIP transfers for those staying at the four sponsor hotels. The Geislers wanted to demonstrate to their guests that Los Cabos is a safe, fun and carefree destination known for its unparalleled hospitality, diverse activities, natural beauty and philanthropic spirit. 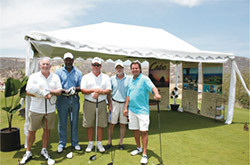 The Cabo Celebrity Invitational benefited the Lorena Ochoa Golf Foundation and the Los Cabos-based charity Liga MAC A.C., which has provided educational programs, basic needs and medical assistance to families and individuals in San Jose del Cabo since 1997. 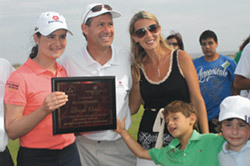 “Our social life in Los Cabos has always revolved around giving back. For so many years almost every social or sporting event supported our community in some way, so Andrea and I wanted the tournament to be really entertaining and appealing to golfers and their families as well as benefiting charity,” said Paul Geisler in a recent interview. And fun it was. The tournament kicked off with a complimentary practice round at any one of tournament sponsor Grupo Questro’s Cabo Real, Club Campestre and Puerto Los Cabos (PLC) courses. Later that evening, celebrity invitees mingled at a cocktail party with music by Palmilla Quinteto at the hip Suviche Restaurant in the One&Only Palmilla, one of four event sponsor hotels along with Los Ventanas al Paraiso, Hilton Los Cabos and Cabo Azul. Meanwhile, private gallery receptions for tournament players and non-golfing participants went on at Galeria de Ida Victoria, Frank Arnold Gallery and Metin/Natus Gallery during the famed Thursday Night Art Walk” in the Art District of San Jose del Cabo’s Historic Downtown Square. “Frequent visitors know that Los Cabos is friendly and outgoing and that in spite of its size and diversity it still has a gracious “small town” feel. We also wanted our first time guests to experience our history and culture. A night out at the legendary Palmilla and colonial San Jose’s historic downtown brought another dimension to the tournament,” said Czechoslovak-born Andrea Geisler, adding, “People hear about Cabo and think it’s only sun and fun but San Jose was actually founded by Jesuits in 1730 and it’s so charming we just had to share it.” The Geislers made it easy for everyone to get to each event and non-golf activity with DMC Transcabo’s complimentary VIP transfers for those staying at the four sponsor hotels. On Friday, the Puerto Los Cabos Golf Course was buzzing with more than 100 golfers teeing off in a Shotgun start. Breakfast both tournament days was served up by Baja Blue and House of Pancakes with La Dolcevilla’s fabulous coffee and gelato. Lunches by CJ New York Deli, Jazmin's and Mr. Gourmet Catering kept the players smiling along with Clase Azul’s tequila tastings, Baja Brewery’s local microbrews and Rockstar energy drinks. Sunology’s non-chemical sunscreen kept the Baja rays at bay and Baja Wide Open and Wild Canyon gave gifts to one of each foursome closest to the pin adding more to an already exciting event. Eight-time World Long Drive Championship finalist Dustin Merrill and World Long Drive Champion and World Long Drive record holder Mike Dobbyn manned Nicklaus’ par 5, 12th hole where players could make a donation to support the Lorena Ochoa Golf Foundation and Liga MAC to use Dobbyn and Merrill’s 400+ yard drives for their game advantage. LPGA legend and new mother Lorena Ochoa lived up to her stellar reputation for friendliness by touring the course with Andrea Geisler and former president of the SCPGA, Jason Taylor, greeting each team and posing for photos, and spreading her very special magic throughout the course. Later, Ochoa’s golf clinic drew many Mexican children and adults eager to see Mexico’s most famous golfer. The clinic began with a Long Drive Exhibition by swing coach Charles Kallassy and long drivers Dustin Merrill and Mike Dobbyn, whose world record drive is an amazing 551-yards. First place team members for Day One were Thomas Corkery, Ben Snyder, Mike Crimmins, Robert Myrick, and Dennis Leoni with Dennis Haysbert, Richard Doermer, John McDermott, Tim Pade and Mike Stubbs the second place team. Off the course, the exclusive Puerto Los Cabos Beach Club hosted non-golf attendees who relaxed poolside, indulging in complimentary activities and sports, and spa services from Suzanne Morel. Some guests opted for the private yacht cruise from Otaduy Luxury Yachts and the famous 52-foot Love Shack while others watched professionals play beach volleyball match with celebrity champs Ryan Mariano, Ed Ratledge and South African player Sean Heyes. Others enjoyed the luxurious oceanfront surroundings with a fabulous catered lunch and wine from Vinoteca. After a great first day of golf at Puerto Los Cabos, Friday night’s Barefoot Elegance event at sponsor hotel the Hilton Los Cabos Beach and Golf Resort featured a shoe valet, an unexpected hit with the crowd. Lovely tapas and hors d'oeuvres were enjoyed to the sounds of live jazz from the Diego Ramirez Trio. 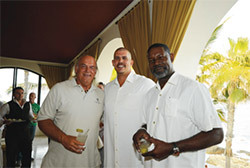 The Hilton’s renowned hospitality provided the perfect atmosphere for the Cabo Celebrity Invitational’s opening festivities. Saturday brought another fine day of golf at Puerto Los Cabos while non-golfers took culinary classes at Las Ventanas al Paraiso, One&Only Palmilla and Los Tamarindos Organic Farm. Out on the Nicklaus-Norman course, teams vied for top spot with an eye toward the evening’s awards ceremony and festivities at Grupo Questro’s private Club Campestre Beach Club. Topping the scoreboard at the end of Day Two were one of the event sponsors, Ed Hooton from Red Group, John Boggs, Tom Law, Richard Anderson, pro golfer Elena Robles and actor Dennis Haysbert. 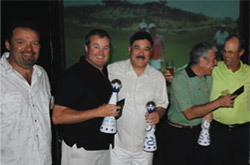 Sunology’s Richard Doermer, John McDermott, Tim Pade, Mike Stubbs and long drive champ Mike Dobbyn took second place. The final gala awards night at the exclusive Club Campestre Beach Club began with attendees, celebrity guests and Liga MAC volunteers mingling over cocktails and canapés from Denis Catering and enjoying the Latin sounds of Kimbara, which performs locally at the Bahia Hotel and Baja Brewery, both event sponsors. As the sun began to dip into the fuchsia horizon the crowd moved to the open air beachfront dining area, elegantly dressed in white, where 11 of Los Cabos finest restaurants wowed diners with culinary creations from Mexico and around the globe. Kudos go to Casianos, Deckman's at Havana, Restaurant H, La Dolce Villa, La Panga, Mi Casa, Mi Cocina, Morgan's Cellar, Peacock's, Pitahayas and Voila Bistro. Wines were provided by Vinoteca and premium tequila and spirits were flowing freely when emcee Charles Kallassy took to the stage to announce the tournament winners. Day One and Two first place winning teams received hand-rolled Cuban cigars in humidor boxes from Cubano Shop, Clase Azul tequila, hand-blown glass trophies from Baja Blown Glass and Art and $1,000 USD gift certificates from Diamonds International. Moments later Eugene Oregon’s ‘alternative rock’ band Rootdown took to the stage and the crowd let loose… by the end of the night the stage was packed with dancing celebs, sponsors and players. 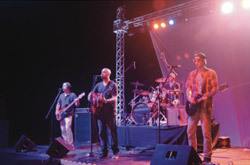 After hours, Rootdown took the party private with an acoustic session around a beach bonfire that blazed until dawn. After three days of exceptional golf, activities and events, the Los Cabo Celebrity Invitational tournament raised $65,000 USD for the Lorena Ochoa Golf Foundation and $10,000 USD for Liga MAC. Good things, indeed, do come in threes.